Even though The Civil War, published by Victory Games, is a strategic/grand operational level game, the clever movement and reaction rules make maneuver a more important aspect of the game than is usual for titles on this scale. Often times a key objective will be won without firing a shot, as one army or the other finds itself outmaneuvered and dangerously exposed and decides to wisely give up the objective to “fight another day”. This article offers a technique for effectively screening an enemy Army that does not have any Cavalry leaders present. An army’s Cavalry is the best source of information on enemy troop movements and can be used to great effect as a raiding force to destroy enemy supply depots and deny control of critical rail junctions. Cavalry, when properly used in this game, can also be quite effective in inhibiting movement of enemy forces. Given the right conditions a 1 strength point force under a Cavalry leader can halt the movement of an enemy army many times its own size. Three contiguous hexes, in a straight line, identified as hexes A, B, and C, such that hex B lies between hexes A and C (see figure 1). A 20 strength point Union Army, with no Cavalry Leader, in hex A. 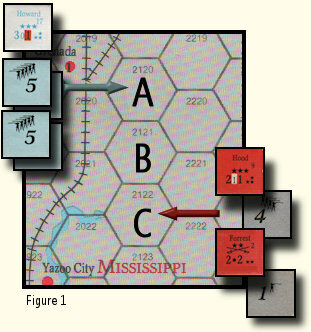 The Union force in hex A moves into hex B, attempting to either draw the Confederates into a fight they can’t win or, failing that, to bypass them entirely and drive deep into Mississippi. The Confederates reaction needs to both preserve their small army, and prevent the rampaging Union army from driving any deeper into the South. 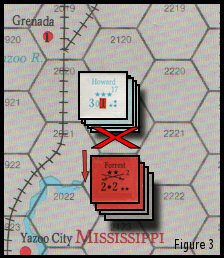 The Confederate Army in hex C executes a successful partial reaction (see “Partial Reaction Movement”, under rules section 9.3) by sending only the Cavalry force of 1 strength point and Cavalry Leader Forrest into hex B. Since the reacting force is considered to have arrived before the force that caused the reaction, the reacting Cavalry force is considered to be the “defender”. Additionally, it is eligible for “Retreat Before Combat”, due to the fact that the moving Union force has no Cavalry Leader (see figure 2). This, according to rules sections 4.1 and 10.1, will cause the “screening” of the moving force, thereby halting its movement. And the best part of the maneuver is that the screening Cavalry unit can then retreat back into the hex with the Confederate army, regaining its original position (see figure 3). Well, almost perfect. The retreat before combat maneuver can only fail if the commanding Cavalry leader fails his leader loss check by being killed or wounded. 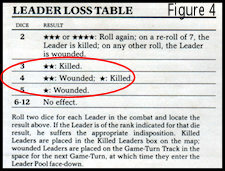 There is only a 16.66% chance of this happening since 1-star leaders are only killed/wounded on a roll of 4 or 5 (rolling two dice), and 2-star leaders only fail on rolls of 3 or 4 (see figure 4). So the risk is minimal when weighed against the benefit. 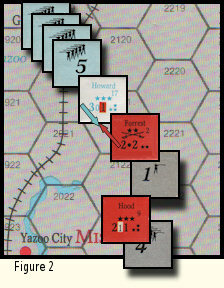 In this example, a 5-strength point army completely stonewalled the movement of a much larger force with minimal risk to itself. You should always retain at least one Cavalry leader with each of your armies to prevent your opponent from running you into the “Cavalry Stone Wall”. Posted in Civil War, The and tagged Board Game Strategy, Civil War Games, Eric Lee Smith, Victory Games, War Game Strategy. Bookmark the permalink.